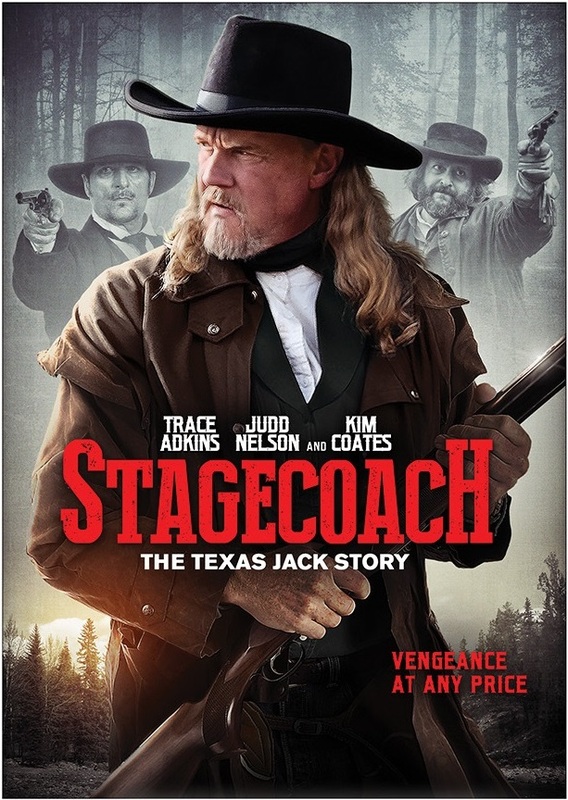 LOS ANGELES, CA – Revenge and redemption make uneasy bedfellows in STAGECOACH: THE TEXAS JACK STORY, a hardscrabble period Western loosely based on the real-life exploits of 19th-century American outlaw Nathaniel Reed, starring country music superstar Trace Adkins (Traded, The Virginian, The Lincoln Lawyer), Judd Nelson (The Breakfast Club, St. Elmo’s Fire, “Suddenly Susan”) and Kim Coates (“Sons of Anarchy”). On November 4, the frontier thriller opens theatrically in ten markets including New York, Los Angeles, Chicago, Philadelphia, Dallas, Houston, Phoenix, Denver, Tampa-St. Petersburg and Kansas City; and, day-and-date, it will also be available via on demand and Digital HD. After retiring from his life as an infamous outlaw, livery owner Nathaniel Reed (Adkins) quietly leads an honest existence on the Texas frontier with his devoted wife, Laura Lee. But his gun-slinging past suddenly comes back to haunt him when he learns that Calhoun (Coates), the man he once maimed during a stagecoach robbery, is now an unhinged U.S. Marshal who’ll stop at nothing to exact vengeance. After a violent shootout brings tragic consequences, Nathaniel partners with his original gang, returns to his lawless ways and becomes Texas Jack: the most wanted outlaw in the West. An action-packed quest for redemption, STAGECOACH is filled with gunplay a’plenty, galloping getaways, a beautiful bounty hunter -- and the possibility of a second chance. Directed by Terry Miles (Lonesome Dove Church, Dawn Rider) and written by Matt Williams and Dan Benamor, the film also co-stars Nelson and Claude Duhamel as Reed’s gang, Michelle Harrison (Fifty Shades Darker, “The Flash”) as his wife, frontier doctor Garry Chalk (The Confirmation, Godzilla) and Helena Marie (“Supernatural”) as Calhoun’s volatile partner who pursues vengeance at any price.